"Scarlet" picks up where "Cinder" left off, though you might not know at first. Scarlet Benoit is in France, looking for her missing grandmother. She meets Wolf, a mysterious street fighter with a dangerous past. 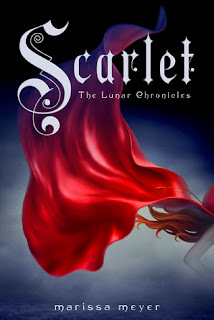 As they forge an uneasy alliance and embark on a mission to find Scarlet's grandmother, Cinder is working on escaping from prison so she can make her way to France and figure out more of her own background. Queen Levana still looms large as a threat, manipulating her way to a marriage with Prince Kai. This is a solid second installment, with a clever retelling of Little Red Riding Hood, and new characters who make great additions to the established cast. Cinder is still a strong female protagonist, and Scarlet joins her ranks. It's clear they're heading toward a meeting from the onset of the book, and I can't wait to see them team up and play off each other's strengths as the series continues. Verdict: Affirmed. Another solid fairy-tale retelling set in an intriguing Sci Fi world, with great additions to the cast. Now, I'm looking forward to getting off the holds list for "Cress." "Scarlet" by Marissa Meyer, published February 5, 2013 by Feiwel and Friends. Audio narration by Rebecca Soler, published February 5, 2013 by Macmillan Audio.